Audeze EL-8 Titanium review | What Hi-Fi? Considering the number of people still using the bundled earphones that come with their phones, aiming a pair of £700 headphones at a smartphone audience does seem like a rather big ask. Then again, with its most expensive headphones topping out at over £3000, Audeze isn’t exactly known for concerning itself with price. The Audeze EL-8 Titanium headphones look every bit as premium as their price tag suggests. Designed in collaboration with the team that worked on the BMW i8, the Audeze EL-8s offer large black and silver aluminium earcups that swivel flat, soft squishy earpads and a chunky cushioned headband. They’re sturdy and well-built, but at a hefty 460g, they’re hitting the limits of what we would consider portable. That said, the fact that a travel case isn’t included for headphones aimed at smartphone users is a shame. They’re comfy enough for short wear, but they weigh heavy on our head during longer listening sessions, and while those earpads are hugely comfy, they’ll really heat up your ears given an hour or two. Audeze has shown a real dedication to Lightning connectivity, even before the iPhone 7 came out, with the EL-8 Titanium Lightning headphones acting as the bigger sibling to the Audeze Sine. The removable flat Cipher Lightning cable plugs into each earcup individually, with a chunky inline mic and remote sitting where the two cables join. This also houses the headphones’ 24-bit DAC and amplifier, automatically bypassing those built into the iPhone. That’s important – there is a 3.5mm cable included in the box too, but we find these just too inefficient for a smartphone to drive to high levels using the standard cable. The Lightning connector allows them to go much louder. 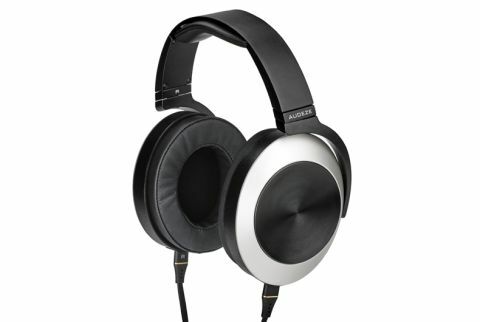 Some of this may be down to the planar magnetic technology inside the EL-8 Titaniums – headphone tech which is notoriously trickier to drive, not to mention which creates bigger, bulkier headphones. We wouldn’t mind so much if the Audeze EL-8s were able to deliver in the sound department, but unfortunately they really leave us wanting. When you first put the headphones on, you’ll be understandably taken with their snug and comfy fit, warm, rich sound and decent sense of space. But listen for longer and you’ll notice they struggle to reach the level of detail and dynamics that you’d expect from a pair of headphones at this price. Instead they sound a little flat and lacking in get up and go. Vocals are focused and direct, and there’s good clarity through the midrange, but they don’t offer much by way of expression or insight. Playing Formation, we notice that Beyonce’s gravelly vocals seem uncharacteristically one-dimensional, lacking the depth and attitude that you’ll hear on a more revealing pair of cans. When the bassline kicks in, it doesn’t hit with as much punch as we’d like. There’s decent bass weight, and it rumbles with a good amount of control, but there’s little texture to the low-end notes. Dynamically it struggles to deliver the impact it’s supposed to. These weaknesses are highlighted again when the chorus kicks in – the EL-8 Titaniums don’t do a good job at communicating tempo changes, whether that’s building up to a crescendo or bringing it back down, which makes them feel a little one-paced and lacking in enthusiasm. It’s certainly a laid back and relaxed listen then, but its lack of expression can make it sound uninterested and disconnected between vocals and instrumental. Timing isn’t as tight as it should be at this level either, which can leave the sound lacking cohesion and organisation. Switch genres to play Nirvana’s In Bloom and the guitar melody sound needs more nuance and momentum to drive it forward. The treble in particular could do with more openness and transparency too – it feels the most affected by the Audeze EL-8 Titanium’s balance and presentation. There’s bite when it’s needed but it doesn’t sound the most natural, nor is it given the same amount of space to develop and extend into as the lower frequency range. The Audeze EL-8 Titanium are well made headphones that certainly make their mark as a more premium offering in the Lightning headphone market. However, when they fall short in the levels of detail, subtlety and dynamics that we’d expect at this price, they become really hard to recommend. That’s only further exacerbated by the fact we’d prefer to listen to the more engaging and insightful B&W P7 Wireless at half the price, or, if you’re keen to keep the wire, the cheaper-still Philips M2Ls will offer a punchier, more exciting performance for just £200. Audeze’s focus on Lightning headphones is heartening for iPhone 7 users hoping to invest in more premium cans, but until they can match the performance to their design, you’re better off looking elsewhere.